A4 - that's 298mm x 210mm in glorious full colour. 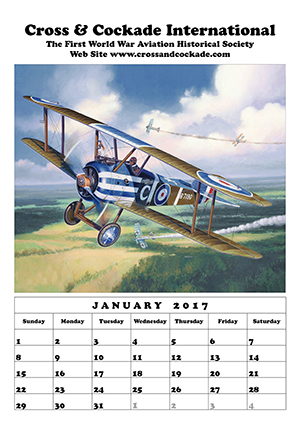 Once again Roger has produced a terrific calendar, that you NEED to have on your study wall. Twelve more superb paintings by world renowned artists - can you afford to miss it? Proceeds go towards ongoing maintenance of the British Air Services Memorial at St Omer, which was erected by the society in 2004 to commemorate the 8,000 airmen who gave their lives in France and Flanders during WW1. Built in small numbers late in1918, the Hugo Junkers designed D.I (J.9) was the first all-metal fighter. An example is on show at the Musee de l'Air in Paris. "Last One to Blink Wins". Over 12,500 examples of the Nieuport sesquiplane design were produced. Many remained in service (as trainers) into the 1920s. "God of the North Wind" depicts Fokker Triplane 450/17, one of several flown by 48 victory ace Ltn Josef Jacobs, Staffelfuhrer of Jasta 7 during 1918. "Reach for the Sky, Harry Hawker". Although only five were built, the Sopwith Bat Boat of 1913 was Britain's first successful flying boat and amphibioius aircraft. Stan Stokes "Springtime in Venice". Caproni produced well over 600 biplane and triplane bombers that saw service with Italian, French, British and US air forces.